https://www.nepaconstructionservices.com | 1-855-374-7826 This homeowner had his crawl space previously fixed by another company, but when his neighbor had his home's crawl space treated and encapsulated by Burke Construction, he began having second thoughts. "I was so impressed with how everything was done to perfection, that I regretted ever starting with this other company that had done the work before. 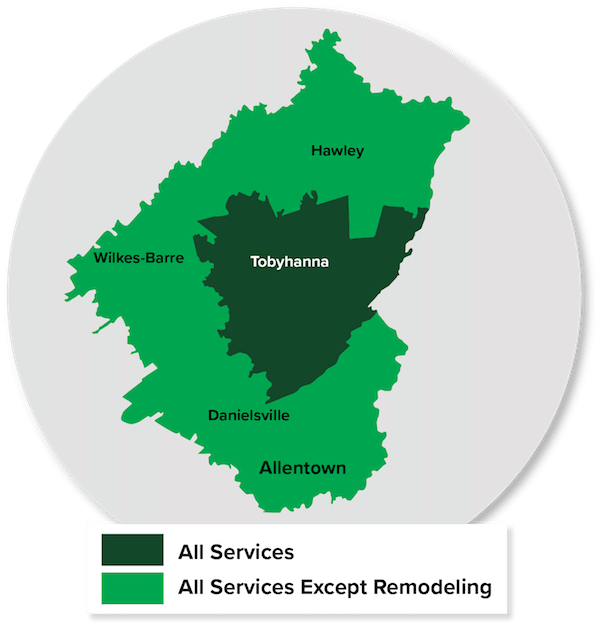 Burke Construction is a Stroudsburg, PA -based remodeling company specialized in bathroom and kitchen remodeling, spray foam insulation and crawl space encapsulation. Very pleased with work performed and final results. Jeremy is a great guy as well as his workers. Would not hesitate to use Burke construction for any and all future home improvements. We hired Burke Construction to encapsulate our crawlspace. The team was very polite, professional and they were able to complete the job sooner than anticipated. I would hire them again. After considerable research on how to save on energy bills, I decided to install additional insulation to our home. Read a lot of good information about Dr. Energy Saver and contacted the local installer. Matt and Jason of Burke Construction showed up to do a blower door test of our home. We were asked what concerns we had with each floor, and remedies were given. We went ahead and scheduled the work. Installers Mike, and Kevin showed up each day (3) and performed their jobs well. They answered any questions I had, and cleaned up at days end. My wife and I are confident we made the right choice in Dr. Energy Saver, and are expecting to see lower energy bills in the future. Great team to work with! Everything went as planned! I hired closed cell spray foam throughout a home we were remodeling. The crew was on time everyday, extremely knowledgeable and professional! We chose Burke Construction because we were impressed with Craig and his willingness to get the job we wanted done. I was in constant contact with him during our selection process. He always returned calls and was happy to address other concerns we had with our home. We had appointments with a few contractors but after meeting Craig Moucha, we were sold on choosing Burke Construction for the work we wanted done. I wanted to let you know how pleased we are with our new deck. The men who did the work here were quick and efficient and a pleasure to have around our home. Their workmanship was top notch. The few glitches that arose during the construction were dealt with in a very professional manner and handled with our satisfaction in mind. You and your whole team are a pleasure to work with. We have had two gatherings on our new deck already and have recommended you to all our friends and we will continue to In the future. Burke Construction installed liner in our crawlspace and spray insulated the walls. The entire crew was professional, clean, polite and they answered our questions thoroughly. We will use them again and highly recommend them! The guys were very pleasant, knowledgeable and respectful. The job went well overall. Even before the job was done we noticed an improvement throughout the house during a very cold snowy week. Very satisfied with how everything went! I hired Burke Construction - Dr. Energy Saver to insulate the knee walls of an existing room and add insulation to a cantilevered area of the house. The showed up on time, neatly performed & EXPLAINED all work. They also took care to clean up. Grade A! We were looking for an honest and reliable company to work on our bathroom and you guys are exactly that. What an unbelievably great job this project turned out. Not only did your crew work great together but your estimate was right within budget! Very nice to deal with and fantastic quality work inside the house and out! Excellent experience dealing with Jeremy & Matt. The crew that came to do the work were friendly, courteous young gentlemen, and they left the place spotless! What a cleanup job! We’re very happy with the service and highly recommend them for spray insulation. Burke Construction is the most professional team I have ever worked with. The owner, Jeremy Burke, kept in touch with me from the start to the end. Highly recommended. Has done other work in the past.